Our product range includes a wide range of pvc pipe bend. We are offering a vast array of PVC Pipe Bend. This product is widely used in several industries, and homes for housing electric wires and cables. The products that we are offering can be availed from us in varied sizes. In addition to this, these are acknowledged among clients for their sturdy construction, high tensile strength, easy installation, anti-corrosive and enhanced durability. 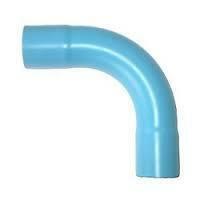 Looking for PVC Pipe Bend ?